Fiction – hardcover; Picador; 256 pages; 2014. Review copy courtesy of the publisher. 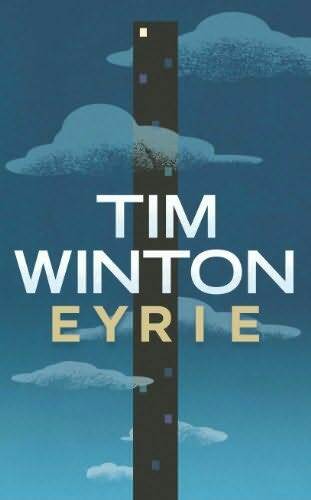 If you’ve ever spoken your mind, or stood up for something you believe in when it might have been easier — and safer — to keep quiet, you will find plenty to identify with in Tim Winton‘s Eyrie, which has just been published in the UK. In this extraordinary novel — Winton’s 11th — we meet Tom Keely, a middle-aged spokesman for an environmental campaign group, who has lost his high-flying, highly pressurised job for daring to speak the truth. He’s also lost his comfortable lifestyle, his lovely house and his marriage. Now, holed up in a flat at the top of a grim high-rise residential tower overlooking Fremantle, he’s living like a recluse: not even his mother, a social justice lawyer, is allowed to visit. Burnt out, broke and clearly ill, he spends his days drinking and his evening popping prescription medication. There is little joy or meaning in his life, but then he meets his neighbours — Gemma, a woman from his past, and her six-year-old grandson, Kai — and things become slightly more interesting — and dangerous. Told in the third person but entirely from Keely’s point of view, the novel charts Keely’s slow return to the world he’s given up on. But as he endeavours to do the right thing by Gemma and Kai, he finds himself becoming immersed in a seedy world far removed from his middle-class upbringing. Lurching from one uncomfortable incident to the next, his behaviour gets increasingly erratic — he makes offensive phone calls to his sister that he can’t remember making, he passes out, he gets dizzy, he vomits — so that by the novel’s end you’re wishing he’d do what his mother keeps telling him and seek some medical advice. But Keely is a man who lives by his own set of rules and follows his own moral compass — and you can’t help but love him for it. Winton does lots of rather clever things with this novel to make it an exceedingly strong, muscular and richly layered read. He never provides straightforward answers about Keely’s situation — how he lost his job, what happened with his wife, is he sick or simply a drug addict — but provides a steady drip feed of clues, so that you can figure it out for yourself. He makes Keely come from a family of “good Samaritans” and intertwines that past history with the present to highlight the legacy of what it is to help others less fortunate than yourself. He then sets the story at the tail end of 2008 during the Global Financial Crisis — which left Australia unscathed — so that he can explore the underbelly of Australian society at a time of great economic prosperity. And then he has Keely, a well-educated man who’s pretty much lost everything, living in a building that houses all kinds of people, including those who had nothing to lose in the first place, so that he can see what happens when a downwardly mobile man falls into that class — will he sink, swim or help the people around him? In exploring what it is to be a good person and what it is to do the right thing — whether for yourself, your family, the people in your community or the environment — Winton shines a light on the way in which contemporary Australians live their lives. Eyrie, which has recently been shortlisted for this year’s Miles Franklin Award, is a sometimes exhilarating, often confronting and always thought-provoking read. I loved its intelligence and its clever set pieces tied together by a fast-paced narrative, but most of all I just loved being held in its sway. I’ve read it twice now — and when I finished it I wanted to turn back to the start and read it all over again. If that’s not the sign of a brilliant book, I don’t know what is. I was fortunate enough to interview Tim Winton in person on his recent promotional tour in the UK for Shiny New Books. You can read it here. Wow, this sounds amazing, he’s an author I seem to have had long intentions of reading and never done so. Must change that status! Love your review, very enticing. Good to hear. I’ve loved much of what he’s written, but I’ve seen a tendency to look down upon him a bit here in Oz (too successful for his own good). Hopefully, I’ll get around to trying this soon (with a much better Australian cover…). Great review, Kim. I enjoyed ‘Eyrie’ a lot and got totally wrapped up in the characters, and even (after an initial ‘what the hell?’ moment) came to like THAT ending, but I read it last November and, unlike ‘Barracuda’, ‘Coal Creek’ and ‘Narrow Road…’ which I read around the same time, Winton’s has left curiously little impression given how much I liked it at the time. For me it wasn’t quite in the same league as ‘Cloudstreet’ or ‘The Turning’ but, having read seven of his books now, I think he is a fantastic writer and would happily read anything he writes. Oh, and I have to agree with Tony: the Australian cover is so much better! Thanks, Claire. Hes pretty much the godfather of Australian literature but usually when I mention his name (especially when I asked for time off work to go and interview him last week) everyone looks at me with blank faces, as if to say WHO? I thought he was much better known in the UK than he actually is, so hopefully this review may encourage more Brits / Americans / Canadians et al to give him a go. Hes a terrific writer. I think that is what you call the tall poppy syndrome. As soon as anyone in Oz achieves a certain level of success theyre chopped down, as if to say who do you think you are? And yes, I agree: the Australian cover is nicer assume you mean the one where you can take the semi-transparent dust jacket off? Oh, the ending does come as quite a shock, doesnt it? Funnily enough, I read Eyrie back in October and loved it. But I could barely remember a thing when I sat down to write this review a few weeks ago. It didnt help that I had lost the notes I made at the time. But then I started reading it again last week (to refresh my memory) and it is one of those rare books that really improves on a second reading. I was impressed by all the myriad themes and sub-plots and the way in which it is all held together so tightly. I really got the impression that this is a writer who knows what he is doing, is really confident with what he is doing, and is prepared to treat his readers with intelligence. He keeps a lot of things in check, doesnt spell it all out and lets you come to your own conclusions. Great review Kim. I’ve just reread the ending and I think I’ve worked it out. Will be interesting to hear him talk about it tonight at the opening of the AusNZ Festival. You’re really convincing! I’ve never read this author because I’ve never find a book that could interest me but this one would do (when in paperback). Shamefully, my library (which has ALL Peter Carey works in English AND in French!) has none of Winton’s book in English. Which of his book(s) would you recommend the most? This one? (if yes, I would wait for the paperback release even after reading your tweet concerning the BD offers). I read Eyrie months ago and still find myself thinking about it and not too many books have that effect. It takes a bit of ‘sorting out’, enjoyed your review. A wonderful review – one I’m really keen to read now having just embarked on my first Winton for #ANZLitMonth. I think this is Winton’s best ever. I’m really looking forward to this. I’ve heard such good reports and now your review. The last Winton I read was his surfing memoir – not something that would top my list by anyone else – the writing was sublime. What was his surfing memoir called? Is it Lands Edge? If so, I read that about 15 years ago (it was a birthday present from some Aussie friends) and was overwhelmed by homesickness. I cant bear to read it again. Well, Ive not read much of Wintons work (for a very long time I put him in a box labelled ocker writing, which I realise now was TOTALLY MISGUIDED AND WRONG) but I truly loved this one. Its such a human tale, for a start. Thanks, Cherie. Yes, I think the books greatest strength is the way it puts the reader firmly in the head of Keely, even though it is not a first person narrative, so that means you have to sort through a lot of stuff and try to figure it out as you go along. I have only read a handful, so I am probably not the best person to suggest which one to read first. But the one that everyone seems to love is Cloudstreet. I read it way back in the early 1990s and have very fond memories of it. I now have the Folio Edition and do plan on re-reading it at some point. Tim Winton is one the best novelists I’ve ever read, (should have included him on my personal best yesterday plus Peter Goldsworthy and Evie Wyld too). I wish I could hear him tonight but grrr not well. Tim Winton has been on my list to read for ages. This sounds great so will deffo get round to it now. Heard him interviewed on R4 at Charleston Festival and he sounded like a really down to earth person too. Thanks Glenda. Hope you enjoyed the opening. I didnt go but hope to attend a few sessions on Saturday and Sunday so maybe I will see you there? Cheers Annabel. It’s a wonderful read; really draws you in and keeps you guessing all along. I’m amazed to hear he doesnt plot anything. He just goes with the flow, as it were. Oh, hes very down to earth. No airs and graces, but frank, forthright, warm and funny. Thank you Tony! I’ve just read your review of ‘The Riders’ and I can’t resist your enthusiasm 🙂 I’ve added the book to my BD’s wishlist. I’ll see later for ‘Dirt Music’. Finished last night. F-a-n-t-a-s-t-i-c novel! It’s terrific, isn’t it? I loved it… so many issues and stuff going on… and the ambiguous ending is really thought-provoking.